"Everything's impossible. 'Til it ain't." Many television series have found new life via the DVD market, and one of the great things is the opportunity to catch something you missed the first time. With the release of the second season of HBO's Carniv�le that opportunity is again here, but the other side of the reality coin is that when a show has been abruptly canceled, then any dangling plot participles that have risen up will be left unresolved. Forever. It's like reading a long book only to find the last chapter has been torn out. That's what happens here with the final episodes of Carniv�le, which is just a horrible way to die off because this is one of those rare what I like to call "too good for television" type of programs. And it's premature cancellation by HBO seems to reinforce the proven doctrine that any show I like will be canceled before its time. My overall dissatisfaction of this 12-episode second season has nothing to do with the content itself, because it is just as weirdly epic as the first, building on the whole mythical dark vs light storyline, set in the post-Depression desolation of the sandstorm-ridden 1930s Dust Bowl, much of it inside a rather creepy traveling carnival. This is pure good vs evil drama, wrapped in dark layers of vague prophecies and second sight, as the two main characters continue their separate spiritual treks—both involving the search for the mysterious Henry Scudder, amongst other things—that are all built on an eventual confrontation. On the side of good there's Ben Hawkins (Nick Stahl), the quiet fugitive rescued from the razing of his desolate farm at the start of season one by the traveling carnival, and the dark side sports Brother Justin Crowe (Clancy Brown), a towering bible-thumping preacher convinced he has become an all-powerful instrument of the Lord. Spread across the rest of season two are nearly all of the familiar oddball side characters from the first season (though not all survive the journey), the majority of which live and work with the carnival. Twin Peaks enigmatic Michael J. Anderson is perfectly cast as the crusty and all-knowing carnival boss Samson, and in a series with so many left-of-center types, his stature and presence is one of the show's defining visuals. The packaging and presentation on this six-disc set remains just as hefty and ornate as the first season—with the elaborate foldout slipcase resembling a large book. This time around the episode titles are all locations (Damascus, NE) or potential destinations (The Road To Damascus), as the story moves through New Mexico, Texas, Oklahoma, Nebraska, Wyoming and ending appropriately enough in New Canaan, California where the paths of ominous Brother Justin and Ben Hawkins reach a deadly intersection. And while that's all well and good as a follow through from the first season it all seems hollow next to the nagging knowledge that the grand payoff that has been built over two seasons is never given the chance to properly play out. 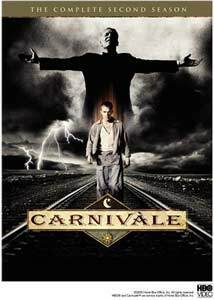 That doesn't necessarily mean the experience itself is bad—Carniv�le really plays like a brooding and spooky long form film broken into one hour segments—it is just that the ending somehow cannot deliver all that it needs to. This isn't a series you can necessarily walk into cold for the second season, though a four-minute season one recap is included. But condensing the plot of an entire season into four minutes isn't really meant as a primer for new folks—there was simply too much going on during the first block of episodes to be suitably summarized. No, it's for the regular followers to continue along with characters and locales that are refreshing and unique, dragged along in the hopes of a resolution that will be somehow rewarding. I suppose there is a way to walk away from this unexpected final season of Carniv�le with some sort of forced conflict resolution, though it's clear the series' writers didn't originally intend in that way. It's a long journey for viewers to invest in a total of 24 one-hour episodes only to be essentially left with more unanswered than answered questions, though the production values on Carniv�le are so unusually high that the visual aspects of the ride itself almost make it worth it. Image Transfer Review: As with the first season, all 12 episodes are presented in 1.85:1 anamorphic widescreen, and the transfers give this series a very cinematic feel. You can almost taste the Dust Bowl grit and grim, and the series is deep with varying dark shades of red, brown, and black. The transfer itself carries itself well, with especially strong black levels throughout the entire run. Audio Transfer Review: Call me Captain Obvious, but bypass the English language 2.0 track in favor of the outstanding Dolby Digital 5.1 surround mix, because the rewards are many. It's a subtle but aggressive mix, with rear channel cues toploaded with ambient sounds that dramatically widen the sound field; directional movement upfront is equally panoramic and spacious. Voice clarity is deep and full-bodied, and understanding even the most raspy or mumbly of characters is never an issue. This is probably one of the finest audio mixes I've come across for a television series. There are also 2.0 surround tracks available in French or Spanish. Extras Review: The six discs are housed in the same type of smart-looking packaging found on the season one set, with the slipcase and foldout case resembling a book. There is a brief Season One Recap (04m:10s) on disc one, and all discs have a Series Index (with short plot summary and which disc it appears on), as well as the "previously on" and "next on" teasers. There are three mediocre commentary tracks spread across twelve episodes, all featuring producer/creator Daniel Knauf and producer Howard Klein. They are joined by actress Clea DuVall and director Tucker Gates for The Road To Damascus, actor Nick Stahl and director Rodrigo Garcia on Lincoln Highway, UT and actor Clancy Brown and director Scott Winant on the series finale New Canaan, CA. The tone for all three is very casual, but they are unfortunately not especially deep in revelatory content. Short version: hardly essential listening, even for diehards. The rest of supplements show up on disc six, beginning with the Discussion With Cast and Creators Courtesy of the Museum of Television and Radio (29m:51s). This March 16, 2004 segment features a live audience panel discussion with producer Howard Klein, producer/creator Daniel Knauf, president of HBO Entertainment Carolyn Straus, as well as cast members Adrienne Barbeau, Clancy Brown, Tim DeKay, Clea DuVall, Amy Madigan, and Nick Stahl. The intros alone take nearly six minutes, but the rest of chatter covers the usual bases of creation and character development, and much about just how unusual Carniv�le really is. Magic & Myth (26m:32s) is definitely worth a peek, and this rather in-depth look at "realizing the vision" gets covered from a few different perspectives, including writers who openly admit that they didn't fully understand what was going on at all times. Details on aspects of the show's underlying themes—some obvious, some not so—get bandied about, intercut with scenes from the series. The Creating The Scene section dissects four scenes (three from Los Moscos, one from The Road To Damascus), each running under five minutes. We are shown a given scene, and then presented with a quick synopsis of how they were imagined and then shot. Each episode is cut into seven chapters, with optional subtitles in English, French or Spanish. Fans of the first season will no doubt want to satisfy their fix with this second set, though the inconclusiveness of the storyline—due to the series' cancellation—will be troubling. They're pricey sets, so I can't really endorse newcomers to jump on board to get both, because the lack of finality really diminishes the overall satisfaction level. Still very cinematic in nature, this is a darkly beautiful looking series that deserved a chance to finish what it started.